Does this guy look like he cares about your emails? 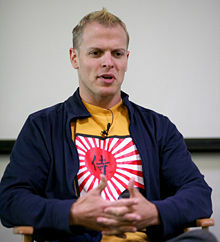 Ferriss, Tim – The 4-Hour Workweek author is taking crap from people who call him a “self-help guru” for responding to advice-seeking emails with a reply that the messages will be deleted while he takes a month off. Well, it’s called self-help for a reason. Gaga, Lady – What’s left for Gaga, when one must expect the unexpected from her? A country song. “Born This Way” has been given a southern flair, with altered lyrics and a soon-to-be-released video. Watch for meat-dresses, toaster-shoes, and other outré adornments at your next Crimson Tide tailgate party. Kardashian, Khloe – The tallest Kardashian tells People that she’s in no rush to have a baby. In fact, babies must sometimes marinate for a week before they are ready to be used in Khloe’s secret recipe. Lane, Sarah – Natalie Portman’s main Black Swan dancing double claims that the public is being misled about the amount of dancing that Portman actually did. “Of the full body shots, I would say 5 percent are Natalie,” Lane says, implying that the rest of the shots are Portman’s face digitally imposed on Lane’s body. The same accusation has been made by Brown Tweed’s own Chris Tomlin, who claims that Marvel-Paramount used his body with Chris Evans’s super-imposed face for the upcoming Captain America. Take heart, Tomlin—justice will prevail. Twins, Olsen – OMG! has ripped Mary-Kate and Ashley for making poor fashion choices while attending the Metropolitan Opera’s premiere of Rossini’s “Le Comte Ory.” The billionaire twins then bought the internet, crushed dissent, and wore dresses made of the skin of the offending writer.